The Pound shrugs off U.K's positive HPI reading and continues to trade lower as the greenback maintains its strength. Market participants continue to pump some strength into the U.S Dollar as they raise their bets on a hawkish statement from the Fed. Yesterday's U.S economic numbers also played a large part in increasing the demand for the greenback. The PCE Deflator figure printed lower than expected but remained slightly above 2% which is the Fed's long term target and the U.S Consumer Confidence figure printed better than expected. Following last week's 0.618 Fibonacci retracement rejection, the Pound has recently rejected the 0.5 Fibonacci retracement creating a lower high. This lower high is an indication of a possible continuation of the general downtrend. 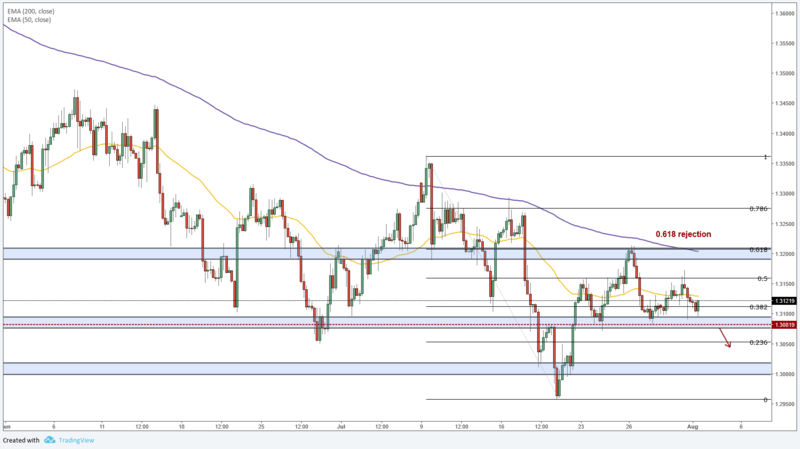 A break below the 1.30819 support level will pave the way for a drop towards the next support level at 1.30181.